There is a special room just to the left upon entering The Bridge at Florissant containing a grenade, an M-1 rifle and a Springfield O3 rifle. 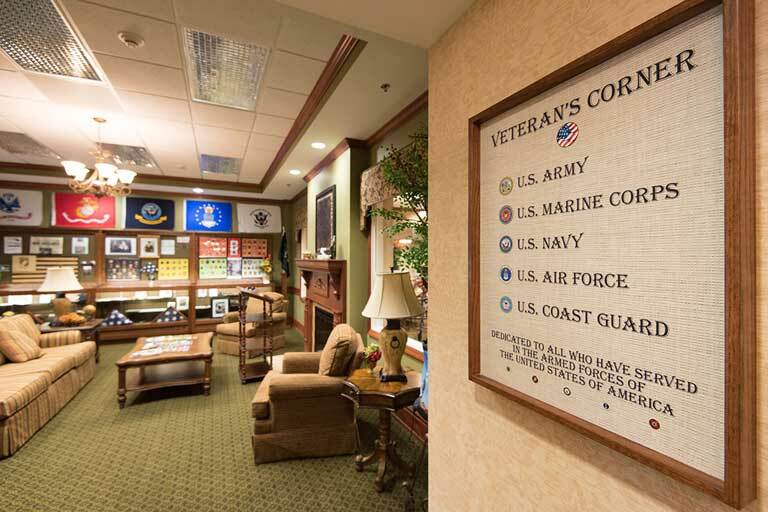 It’s not an armory; it’s the Veteran’s Corner, and it serves as a special space of recognition and honor for the retirement community’s veterans. 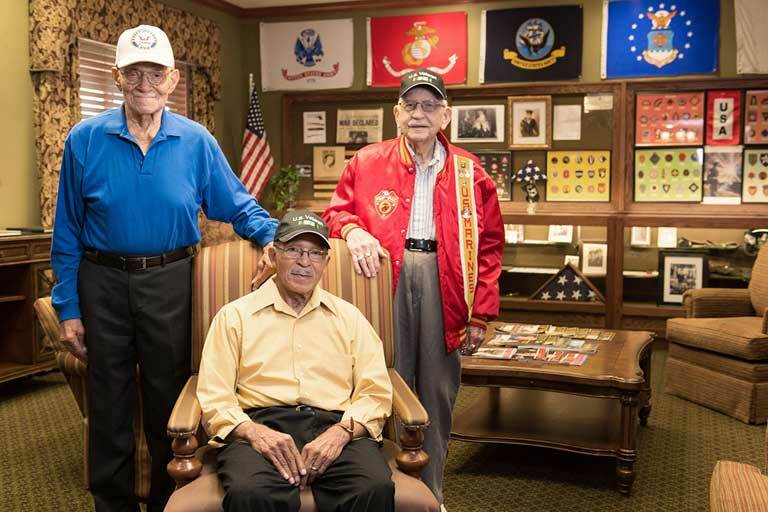 Ninety-two-year-old resident Bill Rupp created the Veteran’s Corner in 2015. Rupp wanted his home at The Bridge to include a place of respect for veterans and their families – he wanted a place for The Bridge’s veterans to gather together and feel appreciated and for others to show appreciation. Rupp, a St. Louis native who met his wife, June, in high school, has been married for more than 70 years. He joined the U.S. Marine Corps at the age of 18 and served in World War II from 1942-1945. He served as an artillery 90-millimeter fuse setter and radar operator and engineer for O Battery in the Asiatic-Pacific Campaign. Rupp’s final assignment was at Camp Lejeune in Jacksonville, North Carolina. Working with the executive director, Rupp was given full creative control to transform the east living room into the Veteran’s Corner. Furniture was removed or replaced, and the décor was altered to fit Rupp’s vision. One wall is now covered with custom crafted, glass display cabinets that were constructed and donated by Rupp’s friend, Patrick Duggan, owner of Duggan Contracting Corporation in St. Peters, Missouri. Rupp has received hundreds of honors during his life, including receiving an award for Veteran of the Year in 2006, one of the highest awards a vet can receive. During the ceremony, he shook hands with President George W. Bush and was awarded with a flag that was flown over the Pentagon. That flag is now on display in the Veteran’s Corner. Yen notes from a Japanese soldier, two imitation rifles and a disarmed grenade are also on display in the room. Missouri Sen. Jill Schupp recognized that the Veteran’s Corner lacked a state flag of Missouri and presented one to Rupp for display. There are also dozens of insignias and medals in the cases. Love letters and uniforms can be found in the Veteran’s Corner, as well. 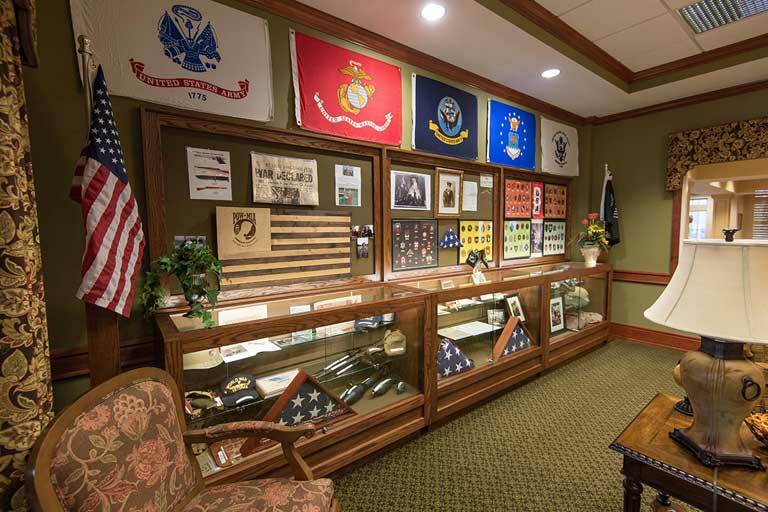 All of the veterans and their families living at The Bridge are encouraged to donate personal military history items for display. Century Park Associates is incredibly proud of all of our veterans and thankful to those who gave their lives in service. Dedicating a space like the Veteran’s Corner is just one of many ways we honor and thank those who served and those who gave their lives for our country. The Veteran’s Corner is used as a library, museum and community gathering area. Tours are given, and guests often have their pictures taken in the beautiful room.